The termination of the Equatorial Undercurrent (EUC) in the eastern equatorial Atlantic during boreal summer and fall, and the fate of the associated saline water masses, are analyzed from in situ hydrological and currents data collected during 19 hydrographic cruises between 2000 and 2007, complemented by observations from Argo profiling floats and PIRATA moorings, and from a numerical simulation of the Tropical Atlantic Ocean for the period 1993–2007. An intense variability of the circulation and hydrological properties is evidenced from observations in the upper thermocline (24.5–26.2 isopycnal layer) between June and November. During early boreal summer, saline water masses are transported eastward in the upper thermocline to the African coast within the EUC, and recirculate westward on both sides of the EUC. In mid-boreal summer, the EUC weakens in the upper thermocline and the equatorial salinity maximum disappears due to intense mixing with the surface waters during the upwelling season. The extra-equatorial salinity maxima are also partially eroded during the boreal summer, with a slight poleward migration of the southern hemisphere maximum until late boreal summer. The upper EUC reappears in September, feeding again the eastern equatorial Atlantic with saline waters until boreal spring. During December–January, numerical results suggest a second seasonal weakening of the EUC in the Gulf of Guinea, with a partial erosion of the associated equatorial salinity maximum. 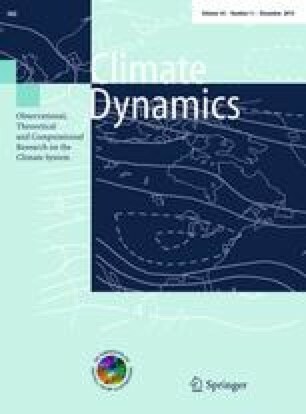 This paper is a contribution to the special issue on tropical Atlantic variability and coupled model climate biases that have been the focus of the recently completed Tropical Atlantic Climate Experiment (TACE), an international CLIVAR program (http://www.clivar.org/organization/atlantic/tace). This special issue is coordinated by William Johns, Peter Brandt, and Ping Chang, representatives of the TACE Observations and TACE Modeling and Synthesis working groups. Based on a French initiative, AMMA was built by an international scientific group and was funded by a large number of agencies, from France, UK, US and Africa. It benefited of a major financial contribution from the European Community’s Sixth Framework Research Programme. Refer to: http://www.amma-international.org for detailed information on this program. The authors also thank the PIRATA program for providing for free precious data sets to the whole scientific community. Authors do thank Jacques Grelet, Fabrice Roubaud, Rémy Chuchla and vessels’ crews who make possible the in situ data acquisition during all EGEE/AMMA and yearly PIRATA cruises. The Argo data are validated and kindly provided by Fabienne Gaillard (LPO, CNRS/Ifremer/IRD/UBO, Brest, France), and funded by the CNES-TOSCA project ‘GLOSCAL’. Authors do also thank Anne-Marie Tréguier for valuable discussions on NEMO simulations, and anonymous reviewers for constructive remarks that helped to substantially improve the manuscript.